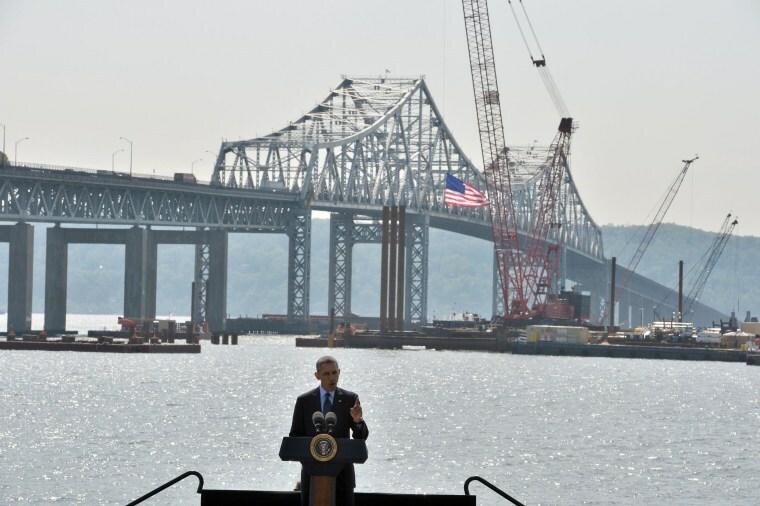 Investing in America’s crumbling roads and bridges should not be a partisan political issue, President Barack Obama said Wednesday against the backdrop of a New York bridge symbolic of the nation’s aging infrastructure. Obama’s renewed attention to the nation’s transportation systems comes as the administration continues to call on Congress to pass legislation to help repair the country’s struggling infrastructure. Officials say the Highway Trust Fund, which is funded by gasoline taxes, could become insolvent by the end of summer and put as many as 700,000 jobs in jeopardy if Congress does not act. “[Republicans] are more interested in saying no because they are worried that maybe they’ll have to be at a bill signing with me than they are at actually doing a job they know would be good for America,” Obama said before listing a number of former GOP presidents who undertook major infrastructure projects. New York’s Tappan Zee Bridge is nearly 60 years old and has seen a 30 percent increase in traffic volume since 1990. The bridge is one of 50 projects for which federal agencies have expedited the review and permitting process in the hopes that construction can begin more quickly. “We are cutting the bureaucratic red tape that stalls good projects from taking off,” Obama said. While the administration has taken executive actions to speed up the review process, Congress will need to act in order to address the most severe infrastructure problems. The White House has put forward a four-year, $302 billion transportation plan that would increase investment and help prepare the nation’s roads and bridges for the population growth expected in coming years. But that plan will be difficult to pass in the Republican-controlled House. On Monday, the Senate introduced its own transportation bill, which does not go as far as the administration’s proposal. Even the bipartisan Senate bill faces a tough road to passage in an election year, and may linger until the lame duck session after the November contests. “Our hope is that Congress will act as soon as possible, and we hope that happens before the Highway Trust Fund becomes insolvent,” Secretary of Transportation Anthony Foxx said Monday.